Once upon a time, there was a tribe of people who lived on the sea. Known as the Badjao, their children learned to swim before they could walk. As adults, they could free dive to great depths and hold their breaths for five minutes while hunting along the ocean floor. And, their eyes could focus under water. Today, modern civilization has been driving the Badjao off the seas between Borneo, the Philippines and Indonesia. Without IDs or citizenship, the authorities want them to live on dry land in filthy slums overrun by garbage and rodents. Nearby, tourists stay in luxurious vacation resorts. 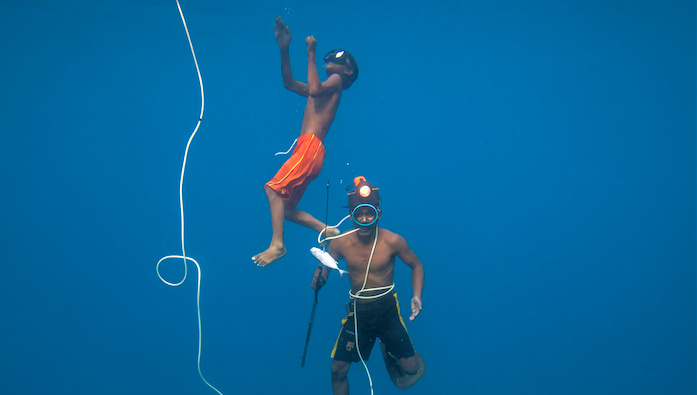 As the Badjao’s old way of life quickly heads toward extinction, Alexan—Mabul Island’s last compressor diver—tries to pass on their traditions to 10-year-old Sari. He tells his nephew wondrous tales about their ancestors and the secrets of the sea, weaving truth and fantasy. Sari, however, is torn between becoming a fisherman like his uncle and living a more modern life on land. WALKING UNDER WATER is a breathtaking ode to the Badjao people and their changing way of life. 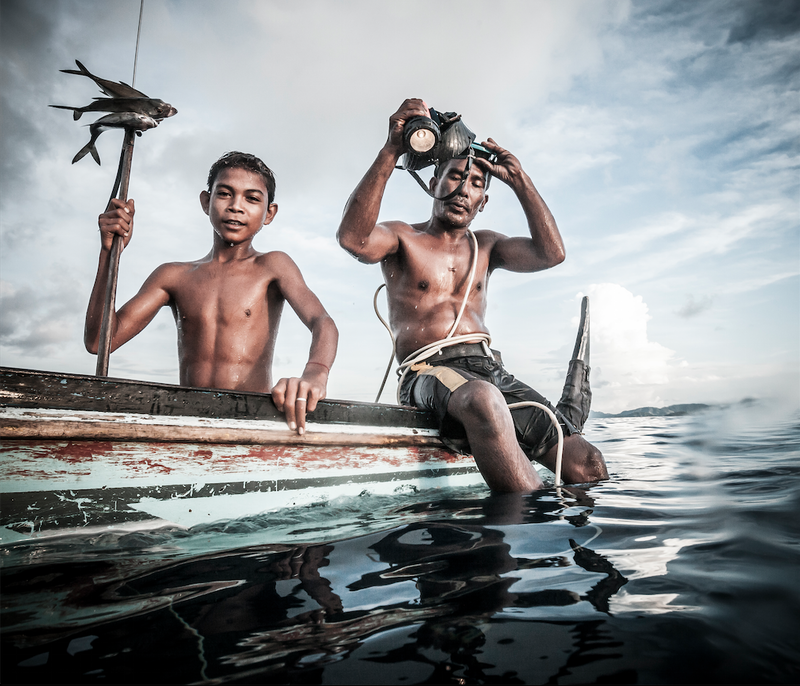 Told with stunning underwater photography, we enter an aquatic kingdom that was once a home to this ancient tribe—and which descendants like Alexan are trying not to lose. Salem Film Fest Writer Sarah Wolfe caught up with Director Eliza Kubarska to discuss her latest work, which received awards from the LA Film Festival and Hot Docs. An adventure filmmaker and professional mountain climber, she is currently home in Poland with her infant son and planning for another trip to Borneo. Sarah Wolfe: What an incredible story this is about the Badjao people. Also, is it true their eyes can actually focus underwater? Eliza Kubarska: Thank you! And yes, scientific research confirmed that Badjao eyes can focus underwater. Many of them can spend a long time without breathing as well. It looks like a natural ability. It’s also not strange to them when their children can swim faster than walk. To them, the sea is home. SW: What made you decide to make a film about the Badjao, also known as the Borneo Sea Nomads? EK: It was back in 2010 when I had just finished my previous documentary, MOUNTAIN LOVE STORY. My husband and I went to Asia for six months, where we climbed and worked on a video photography project. I was also looking for a new topic for my next documentary. We happened to be traveling on the sea in Borneo with a local Badjao guide when we spotted something unusual: a young boy in a small boat out in the middle of nowhere. But it turned out he wasn’t alone. More than 60 feet below was his father, a compressor diver. This small child was completely responsible for his father’s life. It wasn’t Sari or Alexan out there, but this encounter gave me the idea for a documentary about a boy and his teacher—a Badjao diver. I also wanted to show the contrast between two worlds: the animistic world of the Badjao (where the sea and land have souls) and the world of modern tourism and vacation resorts. I decided to set the film in and around Mabul Island, where Alexan and Sari live and where Alexan is the last compressor diver. The island belongs to Malaysia and used to be populated mainly by Badjao people just 20 years ago. Since outsiders discovered this paradise, Mabul and its surrounding islands have become among the most popular spots for scuba diving in the world. Now there’s no place for the Badjao on the sea and they’re being driven into slums like the one Alexan and Sari live in, which is right beside a tourist resort. The Badjao have no documents, don’t belong to any countries and therefore have no one to protect them. SW: You initially spent two weeks with Alexan’s family on the sea between islands. After that trip, how long did you film them for? EK: I started working on the film in 2011. I had to learn to scuba dive in order to see what the Badajo can do underwater. Together with my excellent UK producer, Monika Braid, we looked for funding. In the autumn of 2012, I came back with Piotr Rosołowski, the Director of Photography, and a few months later in the spring of 2013 we finished shooting. My husband, David Kaszlikowski, did the above and underwater photography and Lisa Strohmayer did underwater camera work. All together I visited Borneo six times, spending long periods with the Badjao on the sea. I was very happy there. SW: Any idea how far down Alexan can free dive? EK: When we were filming we went down as much as 80 feet together. I didn’t want him to go deeper (it’s more dangerous), but he was able to do it. Under the water he feels totally relaxed. I learned that some compressor divers can go nearly 100 feet down. Unfortunately I never tried breathing through that small hose that runs up to the surface when diving. I believe it’s very hard, but I hope to try it next time. SW: Have you kept in touch with Alexan and Sari? Have they seen the film and, if so, what do they think? EK: I used to be in touch with them. Alexan unfortunately doesn’t have a phone and I don’t speak the Badjao language, so the connection hasn’t been easy. I know people who live there and can tell me more or less what’s going on, but it’s not the same. Alexan and Sari haven’t watched the film yet. My plan was to go back to Mabul Island in 2014, but my husband and I found that we were expecting a child. Now I have a little baby boy. I need to wait a few months before I can take him with us to Borneo. I’m sure the Badjao will be happy to see me as a mother. For them, children are the most precious treasure. SW: Speaking of children, I understand you’re running a campaign to raise money to build a school for Sari and the youth of Mabul Island?